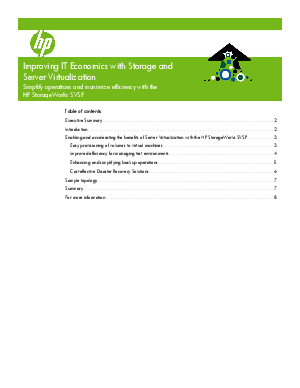 This white paper describes the powerful combination of HP StorageWorks SVSP storage virtualization solution with server virtualization products to produce a more dynamic IT infrastructure that improves efficiencies and simplifies operations. The rapid proliferation of server virtualization technologies (especially VMware) is due to the value of easily consolidating many servers and applications, into a single physical device, allowing many instances to run on a common hardware platform. In this manner, it is possible to take tens-or even hundreds-of underutilized physical servers and consolidate them into a few easy-to-manage servers while maintaining the logical separation between each application.